The First World War introduced Australia to the operational capability of the military aircraft and the Australian Flying Corps set the standards for all Australian Service Flying. From this humble beginning the RAAF carried on a proud tradition. While the Australian Flying Corps was manned by members of the Australian Army it was not until the 1960s that the Australian Army was again to have an interest in the operation of its own aircraft in support of the Army. On the 1st December 1960, 16 Army Light Aircraft Squadron was formed at Amberley, Queensland, with a role to support Army activities while at the same time, to train Army pilots - and later technical ground staff - for a planned increase in Army Aviation strength over the following few years. The period from 1960 to 1966 is in itself a history of 16 Army Light Aircraft Squadron and its subsequent changes to become on 26 April 1966 the 1st Divisional Army Aviation Regiment. The war in Vietnam and Australia's decision to support the allies in this war saw for the first time since 1919 a flying unit of the Australian Army enter into combat. 161 Reconnaissance Flight was raised at RAAF Base Amberley in June 1965 under the command of Major Paul Lipscombe for deployment to South Vietnam. 1RAR had deployed to Vietnam during June 1965 and was complete on the ground at Bien Hoa on 10 July 1965. Following the authorization of a substantial increase in American Forces the United States Government sought greater efforts from its Allies. President Johnson wrote to Prime Minister Menzies on 26 July 1965, seeking a further Australian contribution. The Defence Committee considered the matter three days later and recommended to the Government that additional forces should be provided. The committee favoured sending a second Battalion which, with the Battalion already allotted to Vietnam and the addition of supporting arms and services, would form a task force. If the military program was not to be seriously disrupted, this force could not be ready before March 1966. In the meantime, it proposed an immediate addition of approximately 300 troops to the Battalion already in Vietnam. This figure was later increased to 350 following Brigadier Mackay's reconnaissance and discussions in Vietnam from 1 to 3 August 1965. The increment would consist of a Field Artillery Battery, a Troop of Engineers, a Reconnaissance Flight, a Signals Troop and additions to the existing Headquarters and Logistic Support Company. On 17 August 1965, the Foreign Affairs and Defence Committee of Cabinet approved the additional force of 350 personnel but not the second Battalion. The force itself and the plan to assemble and move it were both code named TANTON. The troops departed Sydney aboard HMAS Sydney on 11 September, and from Brisbane on 14 September arriving at Vung Tau, South Vietnam, at 0630 hours on 28 September, one hour ahead of schedule. There, the Engineers and the Reconnaissance Flight came under command of 1RAR to form the 1RAR Group, with the 161 Field Battery (RNZA) already in direct support of 1RAR. 105 Field Battery remained under the command of Commander Australian Army Force Vietnam (COMAAFV) and placed under operational control of the US 3rd Artillery Battalion, 319th Artillery, supporting 173 Airborne Brigade. The deployment of the Australian Task Force into Vietnam occurred in stages from mid April to mid June 1966. Speed was essential to reduce the opportunities for enemy interference. The first stage was the occupation of the Logistic Base and transit areas on the Vung Tau Peninsula. Then the clearance of Nui Dat and its environs began in preparation for the move into the Phuoc Tuy Province. The third stage was the occupation of the forward base and the start of intense patrolling. Overall security from the arrival of the advance parties to the deployment at Nui Dat was the responsibility of the 173 Airborne Brigade. Luscombe Army Airfield, the airstrip at Nui Dat, was built by 1 Field Squadron, Royal Australian Engineers, and officially opened on 5 December 1966 by the Commander of the 1 ATF, Brigadier O.D. Jackson. On 13 September 1965, the General Officer Commanding Northern Command, Major General T.F. Cape, DSO, MBE, visited RAAF Base Amberley to review the farewell parade of 161 Reconnaissance Flight. Aircraft and members of the Flight departed Brisbane on 14 September 1965 aboard HMAS Sydney. The trip to Vietnam took 14 days, stopping at Manus Island and Subic Bay on the way to Vung Tau. The aircraft, two Cessna 180s and two Bell 47G-3B1 Sioux helicopters were off-loaded at Vung Tau where compass swings were carried out on the Siouxs and the wings refitted to the Cessnas before the aircraft were flown to Bien Hoa Airbase. The Flight became an integral part of the 1RAR Group, under operational control of 173rd Airborne Brigade (Separate). The first day in South Vietnam for 161 Recce Flt was 28 September 1965. First operational sortie carried out by 161 Recce Flt for 1RAR in the Tactical Area of Responsibility (TAOR) occurred on 22 October 1965. Unit strength increased with "march ins" on the 30 Apr and 26 May 1966. On 13 May 1966, the Main Body of the Flight (three Officers, 33 Other Ranks, five Land Rovers and Trailers) re-deployed to Vung Tau. Moving out at first light from Bien Hoa for Saigon to embark on the LSM Clive Steele for Vung Tau. The aircraft arrived at Vung Tau on 16 May 1966 except for a rear party of one officer and four other ranks who remained at Bien Hoa until 23 May 1966. Unit strength increased with "march ins" on 27 and 29 May and 7 June 1966. Total strength of the Flight at 1600 hrs on 7 June 1966 was 15 Officers and 78 Other Ranks. On 5 June 1966 the Flight ceased being under command of 173rd Airborne Brigade and was in direct support of 1 Australian Task Force. On 7 June 1966, four additional Bell 47 G3B-1 Siouxs and a Cessna 180 arrived at Vung Tau aboard HMAS Sydney. With the increase in manpower, aircraft and maintenance capability, the Flight was re-designated 161 (Independent) Reconnaissance Flight. On 22 March 1967 the Flight commenced the move to Nui Dat and except for those in a rear party the Flight was on the ground at Nui Dat on 24 March 1967. On 29 November 1969, the first Pilatus Porter aircraft arrived in South Vietnam for operations with the Flight. On 1 October 1971, the control of the Flight Command Net was passed to the CP at Vung Tau and the Main Body of the Flight departed Nui Dat for Vung Tau in preparation of the withdrawal of the Flight from South Vietnam. The move to Vung Tau was completed on 5 October 1971 when the rear party handed over the unit area at Nui Dat to 4RAR. Unit strength at the end of November 1971 was 13 Officers and 65 Other Ranks. An advance party commanded by Captain Monteith returned to Australia (Oakey) on 9 December 1971. On 16 December 1971, the Residual Element (Rear Party) consisting of Captain Matheson, 2Lt Triplett, 2Lt Mecham and 12 ORs, assumed responsibility for all operational flying tasks. The main body of 161 (Indep) Recce Flt departed Vung Tau during the early hours of 23 December 1971, leaving Tan Son Nhut, Saigon, by Defence Charter at 1100 hours. The rear party departed Vietnam from Tan Son Nhut Airport for Australia on 7 March 1972 by RAAF C-130 Hercules aircraft. The 161 Recce Flight Detachment (Rear Party) had the distinction of being the last 1ATF unit to leave Vietnam. (The last Australian unit to leave Vietnam was the Australian Army Training Team in December 1972). During operations in South Vietnam the Flight flew in excess of 72,000 hours and the unit Call-Sign was "Possum". On return from Vietnam 161 Reconnaissance Flight was located at Oakey, Queensland, from January 1971 until January 1974. On 31 January 1974, 171 Air Cav Flight, Holsworthy, was re-designated as 161 Reconnaissance Squadron, with an authorised establishment of 13 officers and 27 other ranks. 161 Reconnaissance Flight, Oakey, was re-designated 171 Operational Support Squadron, with an authorised establishment of 12 officers and 27 other ranks. In May/June 1975, the Flight was relocated from the old ANZAC Rifle Range (Holsworthy Army Airfield) to new facilities at Orchard Airfield, which had been built on an old gun position on the northern end of the Holsworthy Range near the 2 Cav Regt area. On 4 July 1991, the 161 Recce Sqn was awarded the U.S. Army Meritorious Unit Commendation (MUC) for the services of the Flight in South Vietnam during 1965 - 1966 as part of the 1 RAR Battalion Group. The MUC is worn by all current serving members of 161 Reconnaissance Squadron. On 5 November 1994, the Squadron ceased operations at Luscombe Army Airfield Holsworthy and commenced a relocation to RAAF Base Darwin resuming operations on 1 March 1995. 161 Reconnaissance Squadron facilities in Darwin were officially opened on 03 May 1995 by Brigadier A.J. Molan AM, Commander 1st Brigade. 161 Recce Sqn operates as part of 1 Aviation Regiment, providing Land Base Reconnaissance, Surveillance and Operational Support to the Army throughout the Area of Direct Military Interest. With the move to Darwin, 161 Recce Sqn has again become a composite Squadron, now operating nine rotary wing helicopters and a Fixed Wing Troop. The Squadron adopted the "Possum" as its mascot and uses "Possum" as its formation Call-Sign today. The Squadron's motto is PARAGON, meaning a model of excellence, which the Squadron strives to demonstrate and maintain in all activities . When 161 Recce Flt arrived in Vietnam waters off the coast of Vung Tau aboard HMAS Sydney the two Bell 47 Sioux helicopters were flown from the ship to Vung Tau airfield in the hands of two intrepid aviators. The aircraft were desirous of some swinging, compass-wise that is, and this intricate exercise necessitated an over-night stay at Vung Tau. 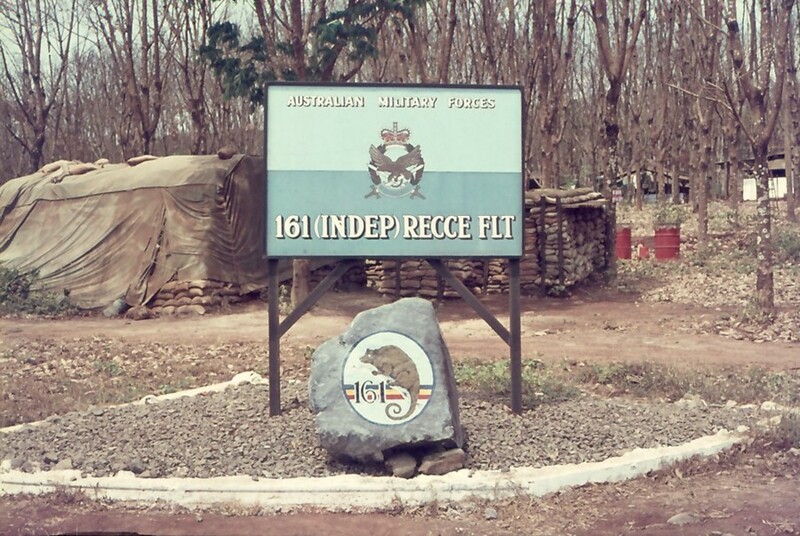 161 Recce Flt was to be part of the 1 RAR Group at Bien Hoa under the operational control of the US Army 173rd Airborne Brigade (Separate). The Brigade had a tradition that units on the Brigade command net both radio and line used pro-words to their call-signs beginning with the letter 'P'. For example, the Brigade HQ switch board was 'Parachute Switch', the Support Battalion was 'Provide' with others like 'Punch' and 'Prowler' being used. When 1 RAR joined the Brigade in mid 1965 they chose 'Platypus' which met the 'P' requirement and had a distinctly Australian National flavour. On the 29 September 1965, Captain Bevan Smith, the senior of the two aviators with the aircraft, was advised that he had to select a suitable call-sign beginning with the letter 'P' before the aircraft could fly north to Bien Hoa, with a flash of brilliance, he chose 'POSSUM' and this word has become enshrined in the annals of Army Aviation history. 161 Reconnaissance Squadron which operates from RAAF Base Darwin uses Call-Sign 'POSSUM' as their unit call-sign for all flying tasks and operations. June 1965 161 Recce Flight raised at RAAF Base Amberley. 12 Sep 65 161 Recce Flight parade at Amberley prior to departing for South Vietnam. HMAS Sydney sailed from Brisbane in company with HMAS Melbourne and HMAS ANZAC. 7 Officers, 42 ORs, 2xCessna 180s and 2xBell 47 Siouxs. ** The Commanders Diary has it recorded as 7 Offrs and 41 ORs. Lt Purvis and WO2 Scafe flew to Vietnam as the advance party for 161 Recce Flt. 19 Sep 65 HMAS Sydney refuels at Manus Island. 20 Sep 65 Departed Manus Island with HMAS Vendetta and HMAS Duchess. 25 Sep 65 HMAS Sydney berthed at Subic Bay for refuel. 29 Sep 65 Two Siouxs depart Vung Tau for Bien Hoa. 01 Oct 65 Cessnas arrive at Bien Hoa. 22 Oct 65 First operational sortie – Recce for 1RAR in TAOR for next operation. Fixed Wing: 16 Sorties and 42.55hrs. Rotary Wing: 76 Sorties and 41.20 hrs. 02 Apr 66 Capt Bevan Smith in A1-395 hit by ground fire whilst on Recce Mission, wounded in left hand, forced landing in nearby ARVN outpost. Pilot medevaced to Australia. 22 Apr 66 Flt Lt Don Tidd marched into the unit on detachment. 10 May 66 Approx 70% of unit stores plus small guard party transported to Saigon, LSM loading point. 11 May 66 Movement of personnel to Vung Tau postponed to 13 May. 13 May 66 Main Body (3 Offrs, 33 ORs, 5 Land Rovers & Trailers) departed Bien Hoa for Saigon. Embarked by LSM arrived Vung Tau, 1700hrs. 16 May 66 Aircraft arrived at Vung Tau. Rear party of 1 Offr and 4 ORs at Bien Hoa. 23 May 66 Rear party arrived - all 161 Recce Flt at Vung Tau. 01 Jun 66 161 Recce Flt re-designated 161 (Indep) Recce Flt. 05 Jun 66 Unit ceased operating under command of 173 Airborne Brigade (Separate) and began direct support of 1 Australian Task Force. 07 Jun 66 Four additional Bell 47s and one Cessna 180 arrived in Vietnam aboard HMAS Sydney. Total strength of the unit at 1600 hrs was 15 Officers and 78 Other Ranks. 31 Oct 66 Cessna A98-045 with Major L.G. Doyle and Capt T.J. Wright was the first fixed wing aircraft to land on the new airfield at Nui Dat. 05 Dec 66 The airfield at Nui Dat was officially opened by Brigadier O.D. Jackson, Commander 1 ATF when he unveiled a commemorative plaque, naming the airfield ‘Luscombe Field’. 22 Mar 67 Unit commenced move to new location at Nui Dat. 24 Mar 66 Move to Nui Dat completed except for rear party at Vung Tau. 10 Apr 67 Rear party from Vung Tau arrived at Nui Dat. The Flight's former living area at Vung Tau was closed and handed back to 1ALSG. 29 Apr 67 Brigadier S.C. Graham, OBE presented the Queens Commendation for brave conduct to 2Lt. R.W. Askew. 23 May 68 The OC of the Flight, Capt George Constable, was shot down and killed whilst flying a US Army O1-G Bird Dog. 01 Jul 68 The Corps of Army Aviation was formed at RAAF Base Amberley, QLD. Nov 69 Three Pilatus Porter fixed wing aircraft arrive in Vietnam. 03 Dec 69 Capt Barry Donald and 2Lt Alan Jellie were shot down and killed in Porter A14-686, whilst night flying. 28 Jun 71 Pilot training commenced at Vung Tau with the 5th Aviation Detachment for conversion onto the OH58A Kiowa helicopter. 24 Jul 71 Saw the arrival of the first of eight OH58As at the unit. 01 Oct 71 The Main Body of the unit departed Nui Dat for Vung Tau. 05 Oct 71 The unit area at Nui Dat was handed over to 4RAR and the rear party. 15 Nov 71 Lt. Grant Steel was shot down whilst flying one of the OH58A Kiowas. Pilot and passenger were not hurt, aircraft was recovered back to Vung Tau. 19 Dec 71 Three OH58As returned to the US Army. 13 Dec 71 The Pilatus Porters withdrawn from service and prepared for return to Australia in Jan 72. 23 Dec 71 The main body of 161 (Indep) Recce Flt departed Vung Tau for Tan Son Nhut and return to Australia by Defence Charter aircraft. 01 Jan 72 Four Porters towed from the airfield at Vung Tau to the Do Long Pier to be loaded aboard the Harima Maru (Japanese Freighter) to be returned to Australia. 02 Feb 72 The remaining four OH58As were handed back to the US Army prior to the rear party returning to Australia on 07 March 1972.